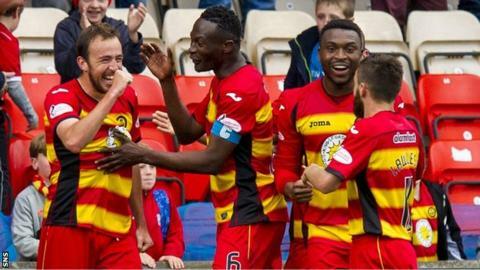 Partick Thistle say they are "now debt free" after restructuring their finances. The club have obtained "new shareholder investment" and an agreement with their bank "has completed the process of wiping out a debt of £1.5m". Thistle, who were promoted to the Scottish Premiership in 2013, had been reducing their debt over the past seven years. "This is a historic day for Partick Thistle," said chairman David Beattie. "This deal is the result of a huge amount of work behind the scenes at Firhill and feels like the ultimate reward for a sustained period of careful financial planning. "I am grateful to the board of directors and all at the club, including our fans, for their support to get us here and to Bank of Scotland for helping us realise our vision. "Before this season started, we explained that one of our objectives going forward was to bring stability to the club. "That's what this deal means for us. What it doesn't mean is that we will become complacent, rather that we will use this as a base to build from." The Jags finished 10th on their return to Scotland's top flight but attendances at Firhill dropped by more than 500 on average. The clubs say crowd "numbers have stabilised in the current season". Thistle encountered financial problems in the late 1990s and were aided by a fans initiative. And, making reference to that campaign, Beattie said: "To put not too fine a point on it, it represents the biggest off the park success story since Save the Jags."